April 11, 2018 – West Hartford, CT – Hoffman SummerWood resident, Ruth Sloate, recently received an Outstanding Resident Accomplishment Award from the Connecticut Assisted Living Association (CALA). She was nominated by SummerWood staff because of her enthusiasm, willingness to volunteer with various projects, and help other new residents settle into the community. Surrounded by her family, Ms. Sloate, along with several other recipients, was honored at a celebratory luncheon heldeld at The Aqua Turf Club in Plantsville, CT on April 5th. Pictured in the photo from left to right: CALA Board Chair, Carlene Rhea; Ruth’s daughter, Ellen Gonzales; son, Mark Sloate; SummerWood resident, Ruth Sloate; CALA President, Chris Carter; and son, Steven Sloate. 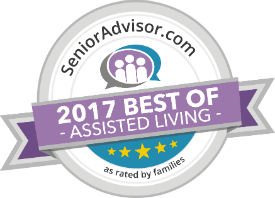 Hoffman SummerWood Community is a national award-winning senior living community located on Simsbury Road in West Hartford and is a Service of Hebrew Senior Care. For more information on SummerWood or any of its programs and services please call 860-523-3808 or visit their website at www.hoffmansummerwood.org. May 23, 2017 – SummerWood’s recent resident satisfaction survey showed 98% of respondents said that SummerWood has provided them with opportunities they would not have had if they remained at home. 98% of respondents agree that moving to SummerWood has been a positive experience. 98% also agreed that SummerWood provides them with a sense of security and opportunities to socialize and create new friendships. 95% of the respondents said they would recommend SummerWood to their friends. 100% of the respondents agree that the managers and staff both have a caring attitude. Executive Director, Joan Carney remarked, “We are thrilled to again share the positive outcome of our annual survey which shows that our residents are happy to make SummerWood their home. We strive to improve our services and programs in order to offer the very best lifestyle.” Worthy to note, Joan Carney is SummerWood’s founding Executive Director, overseeing the planning and development process of programming even before the doors opened in 2001. The core management team has been in place since that time as well. Under Ms. Carney’s leadership, SummerWood has received over 45 national and local awards for outstanding staff, programs, and services. Hoffman SummerWood Community is a senior living community located at 160 Simsbury Road in West Hartford, and is an affiliate of Hebrew HealthCare. For more information please call 860-523-3808 or visit their website at www.hoffmansummerwood.org. March 20, 2017 – Residents and staff of Hoffman SummerWood Community recently continued their annual tradition of delivering a “thank you” lunch to the West Hartford Police Department, the local Fire Department and AMR Ambulance service. As a gesture of appreciation, several residents and staff delivered the lunches and had an opportunity to personally thank the dedicated police officers, fire fighters and medics. “It’s nice to let these individuals know how much we value the work they do…they are always here for us when we need them,” remarked Joan Carney, SummerWood’s Executive Director. The postal carrier, UPS and pharmacy delivery people also received a thank you lunch as they made their deliveries. January 9, 2016 – SummerWood recently hosted its fifth annual Menorah Exhibit which featured roughly 100 menorahs (chanukias) belonging to residents. Family and friends as well as the public were invited to this event. Freshly made latkes and Chanukah music were enjoyed while the attendees perused the displays. People remarked at the variety and intricacies of some of the pieces, many which were made by hand. “The exhibit reminds us all of our family traditions in past years and brings back a lot of memories,” said SummerWood resident, David Silverman . Hoffman SummerWood Community, a national award-winning senior living community located at 160 Simsbury Road in West Hartford, is an affiliate of Hebrew HealthCare. For more information, please call 860-523-3808 or visit their website at www.hoffmansummerwood.org. Featured in photo left to right: Marvin Silverman, Allison Levi, SummerWood resident David Silverman, and Gabi and Zack Silverman.